This article appeared on the New York City Bar Association’s website on Tuesday, March 7. 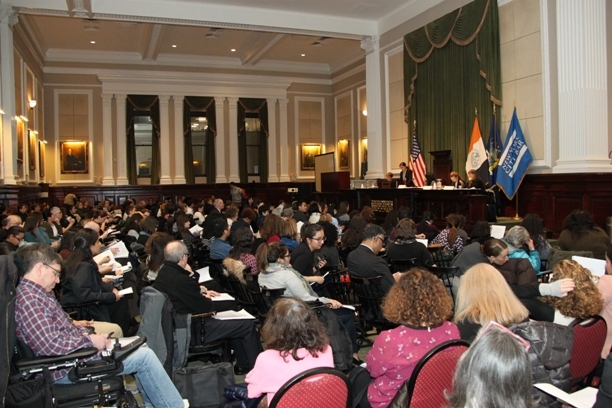 On March 6, the City Bar held “Emergency Preparedness for Families Affected by the Executive Orders on Immigration,” which included a panel of immigration and family law experts who discussed parental directives, and other legal measures immigrant families may be able to take to protect their children. Above: Over 300 attendees filled the Meeting Hall to hear panelists Lee Wang, Staff Attorney, Immigrant Defense Project; Terry D. Lawson, Director, Family and Immigration Unit, Legal Services NYC – Bronx; Ellen Rosenberg, Law Project Director, Women’s Prison Association; Family Law Advisor, Incarcerated Mother’s Law Project, Volunteers of Legal Service; and Sharon Katz, (Moderator), Special Counsel for Pro Bono, Davis Polk LLP. Unable to attend? Davis Polk & Wardwell LLP prepared a guide providing information on childcare options available in New York State for those who want to plan for the care of their children in the event that they are detained or deported. Read the guide here.